Cunard Cruises - Just Cruises, Inc. It was a more civilized era, the Golden Age of Ocean Travel. Crossing the ocean was a grand event unto itself, the very embodiment of sophistication and privilege. And traveling Cunard was what one naturally chose for such a voyage. Cunard's glorious ocean liners were floating palaces of art deco splendor and Edwardian excess, surrounding guests with every comfort and elegance. They attracted the greatest personalities of the day, from world leaders to movie stars, who sipped champagne at festive black-tie soirees and strolled along graceful promenades attired in their finest apparel. It was the quintessence of luxury travel, and getting there was truly half the fun. Take a Cunard voyage and you’ll enjoy the renowned elegance, spacious luxury and excellent service that have attracted discerning travelers to their famous ships for decades. White Star Service - Cunard is synonymous with elegance, luxury and its renowned White Star Service which sets the standard by which all others are judged. Cunard’s commitment to ensuring each guest is pampered begins at the White Star Academy where each crew member is trained to provide impeccable service. Enrichment Programs - Join us on board and you might spot some familiar faces, including writers, actors, film-makers, politicians, explorers, scientists, historians and even the occasional astronauts. 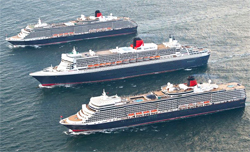 Likely as not, it’s because they’ve been invited to inform and entertain you as part of CUNARD INSIGHTS, regular talks on a variety of contemporary issues by well-known celebrities and personalities.